When in the early 2250s it became clear to Imperial Fleet planners that war with the Federation was all-but certain, plans to upgrade the D-16 destroyer, already in process, were accelerated greatly. The development team put forth an ambitious design that, while sharing many elements of the original design, had greater structural strength as well as incorporating the (at that point) still-new photon torpedo technology, which was a significant advance over the primitive atomic missiles then in use. The end result was a ship that was more durable, but one that could be built by the same shipwrights as the D-16 as the major hull assemblies were substantially the same. The placement of the disruptor banks was altered to two emplacements firing into the forward 270 degree arcs and two firing into the aft arc, giving more balanced beam weapon coverage, though the changes made to add the KP-1 torpedo resulted in the units being downgraded to the less-accurate KD-2. The changes resulted in a ship nearly as defensively strong as the also-under-development D-7 class battle-cruiser, though smaller, weaker-hulled, and only capable of carrying/supporting 10 troops. Plans were made to assign the D-17 to D-7 squadrons as auxiliaries and defensive pickets. Many squadron commanders would also use the destroyer as a super-heavy scout. A number of D-17’s would also be assigned as commerce raiders and privateers. The initial order of D-17’s were directly converted from existing D-16’s. Once the design passed acceptance trials, full production of new-build hulls began in earnest. The class entered full service in 2254, and quickly established an honorable battle record. 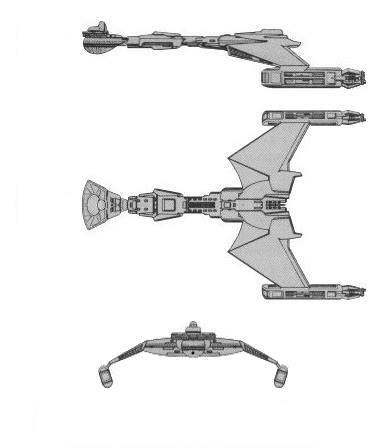 The general utility of the D-17 design made it one the Klingons were eager to keep current technologically. As a result, they implemented a 10-year refit/upgrade cycle. The first major upgrade occurred in 2264 when the warp drive was updated to the KWC-2, a way was found to improve the distuptors to the KD-5, and the torpedo changed to the KP-2. The shield generator was upgraded as well. The resulting B model had roughly forty percent better defensive capability and twice the firepower of the A. This became the pattern with incremental improvements to various systems. The C model, introduced in 2274 was slightly weaker than the B model defensively, but boasted almost sixty-percent more firepower than the B. By the early 2280s, relations with the Federation were beginning to sour once again. That plus the ongoing border skirmishes with the Romulans meant that the 2284 upgrade to the D model would see a fifty-three percent increase in defensive capacity and a forty percent increase in firepower. This upgrade was introduced just prior to the infamous Genesis Incident, which would set the Empire and the Federation directly on the path to war once again, though it would take nearly another decade to reach the flash-point. After eight years of steadily declining interstellar relations, and with mounting internal pressures to expand the borders of the Empire to capture new sources of raw materials, the E upgrade was introduced two full years ahead of schedule in 2292 in preparation for open hostilities, though it turned out to be unneeded as the explosion of Praxis the following year crippled the Empire’s ability to wage war, and the events surrounding the assassination of Chancellor Gorkon and attempted assassination of Chancellor Azetbur led to the signing of the First Khitomer Accords. With the need for continuous upgraded military capacity greatly reduced, the E model would be the final upgrade and end of production for the D-17’s as a class, though the existing ships would continue to serve well into the 24th century. A total of 342 D-17’s were built at Iosia, the same yards that constructed the D-16. Of the 97 D-17A’s built, 4 are listed as missing (all believed to be in service with the IKS), 11 have been destroyed, including 9 during the Four-Years-War, 6 have been scrapped, 3 have been captured (2 by Star Fleet and 1 by interests in the Triangle), 5 were disarmed and sold to Nausiccans, 10 were traded to the Romulans, 30 were placed in reserve fleets, 8 have been sold to ranking families in the empire and 20 were converted to D-17B’s. 91 D-17B’s were built between 2264 and 2279. Combined with the 20 converted a models, the Empire fielded 111 D-17B’s. 2 are listed as missing, 7 have been destroyed and 2 have been scrapped. 2 have been captured (1 by Star Fleet and 1 by the Cardassians), 5 were traded to the Orions, 30 are in reserve fleets and 10 were sold to Ranking Families in the Empire. A total of 53 were converted to C models. Of the 131 D-17C’s fielded (including 78 new builds), 3 are listed as missing, 9 have been destroyed, 4 have been scrapped and 50 were traded to interests in the Triangle. 20 are in reserve fleets and 1 was sold to a ranking family in the empire. 40 were converted to D models. The D model was the last main-line production version of the D-17. 76 new hulls were built with a total of 116 D-17D’s fielded. 1 is listed as missing, 6 have been destroyed, 2 have been scrapped and 1 was captured by the Romulans. 106 were eventually converted to E models. Of the 106 E models fielded, 10 have been destroyed, 6 have been scrapped, 2 have been captured (1 by Cardassians and 1 by Tzenkethi forces), 10 have been sold (5 to the Orions, 3 to interests in the Triangle and 2 to Ferengi interests). 70 are currently in reserve fleets and 8 have been sold to ranking families in the Empire. The last D-17 was removed from mainline service in 2334. The name is a literal translation from the High Klingon “HoS’SuS”. The Federation designation is “Tornado”. Power Units Available – 14 ea. 18 ea. 18 ea. 23 ea. 23 ea.